University of Kentucky Tartan Ceramic Mug. 15 ounce. Printed in USA. Enjoy your morning joe with your university logo and tartan! University of Kentucky Tartan Silk Regular Tie. 100% Silk. Measures 58" x 3 1/4". Made in USA. Dry Clean. Perfect for special events, game day, church, reunions, or any day you want to feel your university pride! University of Kentucky Tartan Silk Bow Tie. 100% Silk. Adjustable to 18". Dry Clean. Made in USA. 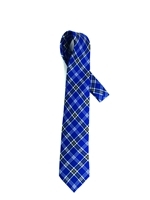 University of Kentucky Tartan Silk X-Long Tie. 100% Silk. Measures 65" x 3 1/4". Made in USA. Dry Clean. Perfect for special events, game day, church, reunions, or any day you want to feel your university pride! University of Kentucky Tartan Lambswool Scarf. Measures 79" x 12" plus 4" fringe. Made in Scotland. Dry Clean. Scottish quality made to last. For men and women in the popular length for knotting around the neck for style and warmth. Add a splash of color to any outfit with your UK Tartan Lambswool Scarf!